Crispy gluten free tart shell made of oats and almonds, a fresh creamy mango cream topped with assorted fresh fruits. Long weekend plans got thrashed when Raj came home on friday night and complained of a body ache. Then came the fever and a massive headache. We really did not have any out of town plans thankfully. 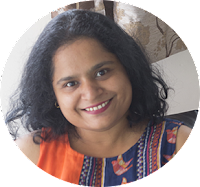 But I had just booked tickets to go watch the movie of the year - "Baahubali - The Conclusion" and I had no company!!! I actually got a cool discount on the already expensive tickets that made me less guilty about splurging so much for a movie. I was not gonna let that go. I though of putting up my tickets for sale online, but I've been waiting months for this movie!! So while I prayed he recovers, I also began searching for back up options on whom to go with. Luckily for me, my sis in law pitched in for her brother. What fun!!! Absolute entertainer, this movie. We were laughing for most of it. Sometimes you really need a melodramatic over the top movie to take you away from the craziness of the real world. I had to cancel plans with friends and family because of the sick guy in the house. I haven't also been cooking too many things. Well, that's not true. I went a little overboard on Sunday and made this taste heavy Mahastrian Thali . Poor guy got to just eat the rice and dal, but the rest of us definitely enjoyed the rest of the meal. #MyWeekendThali is an instagram series I'm doing about my weekend meals. Go check it out!! I have been rambling for three paras now, but I've still not reached my recipe of the day - Fresh Fruit Tart with Mango Cream. I did not make it this weekend. Not with all that bodyache and fever around. I couldn't deny that guy so much of dessert. I actually made this around a month ago, but the recipe was in drafts. Note to self --> Clean out drafts!! So, while it may be a month ago, I remember the taste of this tart as if I'm eating one right now instead of sipping on my ginger tea. The base of this tart, the pastry shell is so simple to make AND it is gluten free and vegan. Oats, Almonds, Dates, Oil, Sugar, Cocoa. I tried to keep it refined sugar free, but the dates I have aren't too sweet and I ran out of them, so I had to add in a little bit of powdered sugar. You can totally avoid the sugar and keep it all natural. Cocoa powder is absolutely optional. Add it if you like a little bit of chocolate bitterness in your dessert. This pastry shell is nothing like the traditional pastry shell, it has a more cookie or biscuity feel to it. And may I suggest, make a little extra of the oats, almond powder, cocoa and dates powder? It tastes SO good!! You can eat spoonfuls of it just like that or may be throw in a little liquid something and make bars or balls of it. You can also store it in this form in the fridge until you are ready to bake. Add in the oil and mix when you are ready to bake. The Mango cream is simply paneer and mango pulp and of course, sugar. I made it fresh as it ends up being a little creamier when fresh. But you can always use store bought paneer (not the frozen kind) or cream cheese instead of making it fresh. Flavor with cardamom or vanilla if Mango isn't in season or if you want a more neutral cream. I'm a total sucker for Mango, so I use it everywhere when in season. Once the pastry shells have cooled, spoon in the mango cream and top with assorted fruits. This is the fun part, you can use whatever you like and have fun decorating the tart. Let you kids do it so they feel they helped you make it. Chill chill in the fridge and then serve. If you plan on eating these after a day or two, I'd suggest to not spoon in the mango cream into the pastry shells but to keep them separately in the fridge and to assemble the tart either while serving or an hour before, else the pastry shells may become soggy. If you made this recipe, let me know! Leave a comment here or on Facebook, tag your tweet with @oneteaspoonlife on Twitter and don't forget to tag your photo #oneteaspoonoflife on Instagram. You can also email me at onetspoflife@gmail.com. I'd love to see what you are upto. If you like this recipe, do not forget to share it with your friends and family! Tender Coconut Ice Cream - 4 ingredient eggless Ice Cream made with Tender Coconuts. Maavina Hannu Seekarne - Aamras or flavored Mango pulp is a popular Summer dessert. No-Bake Strawberry Cheesecake - This no bake Strawberry Cheesecake is egg and gelatin free. 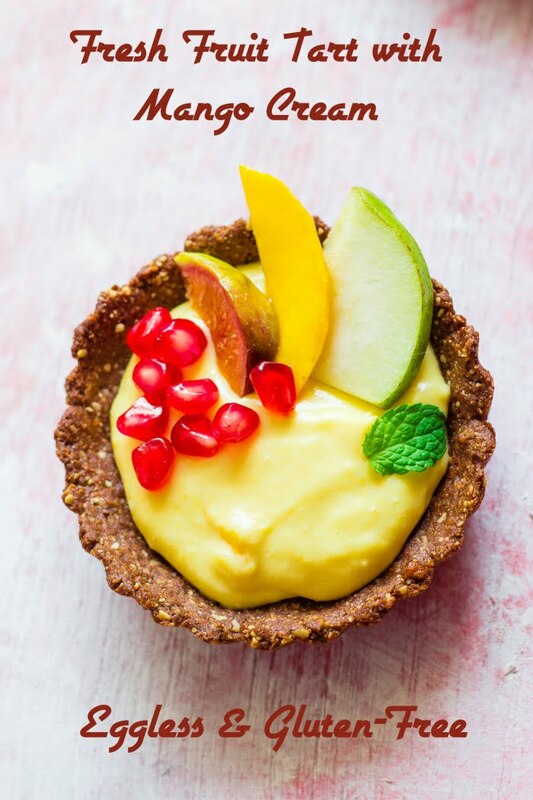 Fresh Fruit Tart with Mango Cream is a dessert with a n oats-almond crust stuffed with mango cream and topped with fresh fruits. Soak dates in hot water for 15 minutes. In a mixer, powder both the rolled oats and almonds until fine. Add cocoa powder, if using and pulse once so that it mixes with the oats and almonds. Cocoa powder gives a the pastry shell a slightly bitter taste after it is baked, you can skip it if you prefer a sweeter pastry shell. Add dates and pulse until combined. Drizzle in oil until you have loose dough. The dough is ready when you can roll a tablespoon of dough into a ball without it crumbling. Add more oil if it is very dry. Add powdered sugar and knead until combined. If the dough feels very sweet already because of the dates, you can skip the powdered sugar. Preheat the oven to 180 degree C.
Grease the pie tins. Divide the dough into 6 equal portions. Take one ball of dough and press it to the bottom of the pie tin. Using your fingers spread the dough so it is evenly distributed and well packed on the bottom and up the sides. Bake the pastry shells for 10-12 minutes. The pastry shell will feel soft when hot. Remove them from the tin and allow to cool on a wire rack. I baked mine for 12 minutes. Boil the milk until it comes to a rolling boil. Remove from heat and add the juice of 1 lime and stir vigorously. Allow the milk to curdle. Once the milk has curdled and the milk solids have separated to leave a clear liquid behind, strain the milk using a muslin cloth or a fine mesh strainer. Keep aside for 15 minutes until the liquid has drained. Peel and puree the mango. Blend the milk solids with 1 Tbsp of water until smooth. Add the mango puree and mix well. Add in powdered sugar by the spoonful until you have the desired sweetness. Once the pastry shells have completely cooled, spoon in the mango cream. Top with chopped fresh fruits. Chill for at least 1 hour before serving. I'll be completely honest, I was never one for a cold breakfast. Hot hot breakfast is what I am used to, and sometimes, I'll satisfy myself with food that is at room temperature. But chilled, just out of the fridge was something that never tempted me. Those rare times I eat cereal, I eat it with warm milk. But a couple of years ago when I went for a training to Hyderabad and was served cold Muesli in the buffet breakfast, I may have just converted a little bit. I still cannot eat cold breakfast every single day but when temperatures soar the way they have begun soaring, a cold breakfast is a relief!! The first weekend I was back from the training, all I wanted to try was this Bircher Muesli... I couldn't wait to go out and buy rolled oats. I did go out, only to realize that the market is flooded with quick cooking oatmeal but there was no rolled oats anywhere. Gourmet super markets carried imported brands but they were super expensive. Finally, I tried making the muesli with oatmeal. While the taste was spot on, the texture really wasn't. Soaking oatmeal overnight gives it this pasty soft texture that is a total turn off. So if you really do make it with oatmeal, I highly recommend a shorted soaking time, maybe 2-3 hours. Then I found this super affordable brand of Rolled Oats here. And luckily for me, just last week I found it stocked in an Organic store in Bangalore. Bircher Muesli it had to be. This Bircher Muesli is till date the ONLY cold breakfast I eat. This muesli is all apple-y and yogurt-y, a flavor combination that tastes fresh and warm while being cold, um huh, you understand? If you are not a yogurt person, just replace it with milk and if you are looking for a vegan option, Almond milk goes great, but for me, it has to be fresh slightly sour yogurt. This is a simple, no-cook recipe. But then, simple food always tastes the best, doesn't it? To make this Bircher Muesli, soak the oats overnight in apple juice. In the morning add yogurt, lots of chopped nuts and lots and lots of chopped fruits. Sugar or honey for sweetness. Now this is something you can add or skip and it won't change the taste one bit - Basil Seeds. Basil seeds are the same family as Chia but are much more economical to purchase. They swell up when soaked in water just like chia seeds. You may know them as Falooda Seeds or Sabze ka beej. I soaked a few tablespoons of it in a cup of water and allowed it to swell while I cut fruits and chopped nuts. Once they had swelled up, I added them to the muesli. Use this recipe as a guide to make your perfect Bircher Muesli or Overnight Oats. I added fruits that my family loves and what are in season here - Apples, Pears, Bananas and Pomegranate (of course, pomegranate). You can use whatever you have. I'm a total "nut" case too, so I always have a variety of nuts and dry fruit stocked up to snack on. Use what is locally available to you. 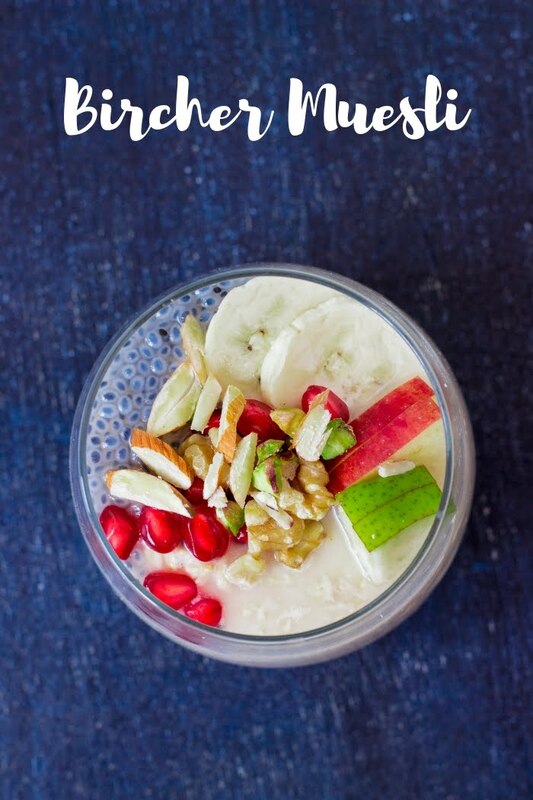 Bircher Muesli or Overnight Oats is a cold breakfast made by soaking rolled oats in apple juice overnight and adding yogurt, nuts and fruits in the morning. Soak the rolled oats in apple juice overnight. In the morning, peel and grate 2 apples and add to the oats. Add whisked yogurt and powdered sugar to taste. Soak the basil seeds in 1 cup of water and allow them to swell up and then add to the muesli. Top with chopped fruits and nuts and serve.